Principles of Real Estate Practice in Massachusetts contains the essentials of the national and Massachusetts real estate law, principles, and practices necessary for basic competence as a real estate professional and as mandated by Massachusetts license law. It is based on our highly successful and popular national publication, Principles of Real Estate Practice, which is in use in real estate schools nationwide. stress practical, rather than theoretical, skills and knowledge. Principles of Real Estate Practice in Massachusetts is streamlined, direct and to-the-point. It includes multiple learning reinforcements. It has a student-oriented organization, both within each chapter and from chapter to chapter. Its examples and exercises are grounded in the authors’ many years in real estate education. Can Principles of Real Estate Practice in Massachusetts be used for the online prelicense, hybrid prelicense and/or CE courses? Absolutely. 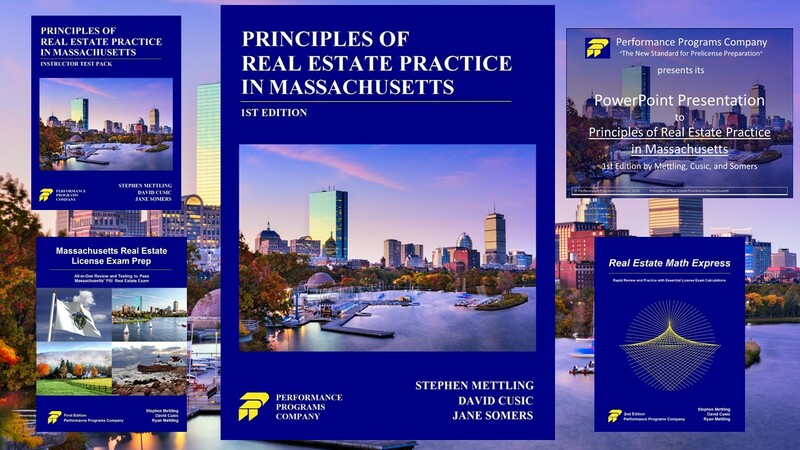 Principles of Real Estate Practice in Massachusetts and our other books can be used for online or hybrid courses through our company’s unique licensing agreement. Our material can be used either to develop new courseware or to improve existing online courses. Once we receive a signed agreement, we email all the digital formats (PDF, Word, ePub) of the textbook and supplemental resources that you can use to create or improve your own online courses. The materials can be copied in the screens, used for reading assignments, converted into audio/video/PowerPoint, etc. behind your school’s learning management system. Feel free to ask us for more information regarding licensing and to see our textbooks’ licensing agreements. 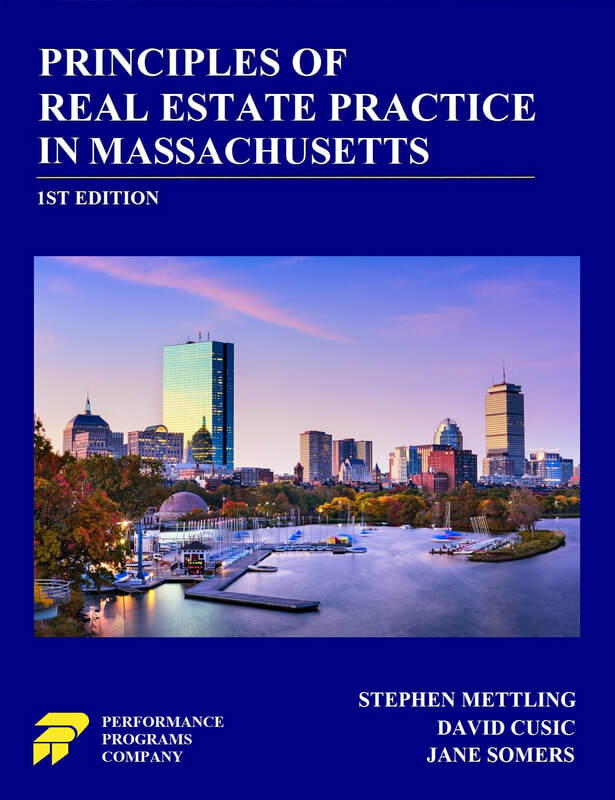 Call or write today for your complimentary copy of Principles of Real Estate Practice in Massachusetts by Mettling, Cusic, and Somers. Find out why more and more schools are switching to Principles of Real Estate Practice in Massachusetts! Stephen Mettling and David Cusic have operated one of the nation's most successful custom training organizations specializing in real estate program development. They are perhaps best known for writing Principles of Real Estate Practice, a national real estate principles textbook used by over 60,000 students per year. Stephen Mettling has been a real estate educator and custom training program developer specializing in real estate over the past forty years. During that time he has written or co-developed over 100 books, professional training programs and texts covering all aspects of residential, commercial, and corporate real estate for national trade organizations and real estate companies. Additionally Steve has directed numerous statewide real estate schools and served as vice president of Dearborn Financial Services where he headed up the country’s largest real estate, securities and insurance license training network. Dr. Cusic, an author and educator, has been engaged in vocation-oriented education since 1966. David earned his Ph.D in linguistics from Stanford University. Specializing in real estate training since 1978, he has developed numerous real estate training programs for corporate and institutional clients around the country including NAR, CoreNet Global, and the CCIM Institute. Jane Somers has been a writer and educator for more than 30 years. She has directed the academic programs for a multi-campus college and has in recent years become an accomplished developer of online and classroom real estate curricula for a national real estate licensing organization, specializing in state licensing laws. Ms. Somers is also active in condominium association management and has served as president of a condominium owners association for ten years. Jeanne has over 30 years public and private sector real estate experience in education, sales, leasing, planning and development. Her training career includes teaching real estate investment at Northeastern University and subsequently for her own license training institute, the New England Real Estate Academy. Jeanne was also awarded a faculty seat with the CCIM Institute in 2005 where she was awarded the CCIM Instructor of the Year in 2011. In the business sector, Jeanne has owned and operated a multi–office residential / commercial real estate firm and has been District Director for Century 21 & Prudential Commercial Real Estate. Jeanne has also served with the FDIC in Boston specializing in sales and loan restructuring, and as Commissioner of the Southeastern Regional Planning and Economic Development District . Jeanne is licensed as a Massachusetts and Rhode Island Real Estate Broker,Massachusetts Real Estate Instructor, and Securities Series 39 and 63 instructor. Jeanne earned a Bachelor’s degree in Business Administration, and has held the prestigious CCIM designation since 1984.